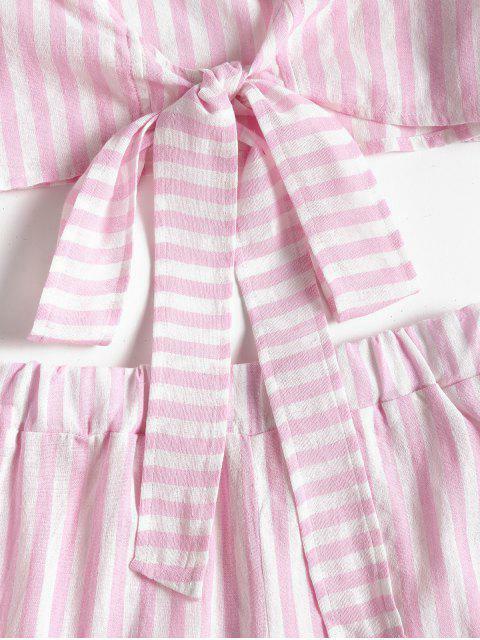 [27% OFF] 2019 Bowknot Stripes Top And Tiered Hem Shorts Set In PIG PINK | ZAFUL .. I love the quality of the fabric, it looks just like the pictures. The only con I found is that the elastic band on the shorts are slightly tight. The color or great. I went with the M according to the size chart, overall it fit great.I am 5’25 and weight 137. I am 34D and 4 on bottoms. Super cute ! The material is very soft and thin it’s fantastic for summer days. True to size .Love it ! I order M fits perfect I am 1.73 cm Bust-84/waist-70 / hips 94. I really love this outfit! The material isn’t the best but it’s great for the price. I’m 5’3” 125 pounds and got a small. Good fit! Sweet and fresh is in the air with this two-piece set. Including a top featuring a flirty tie-front accent with a cropped fit and the high waisted shorts with a tiered, ruffled hem, this soft striped set is an ideal outfit for some occasion from the weekend outing to the day date.